A few years ago, the Welsh Rugby team were sponsored by Brains, the Welsh brewery. It was a great tie up. 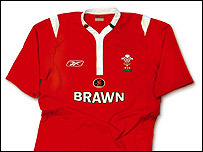 Once, Wales played an away game in France, where alcohol sponsorship is banned. So they couldn’t have ‘Brains’ on their shirts. The clever marketing people at Brains took their logo and switched it to “Brawn”. Same font, layout, etc. Everyone knew what it meant and who it represented. Brains vs. Brawn. Clever, memorable and a good description of rugby. This post was originally published here on Predatory Thinking.